Leisure Lakes has its own jet ski lakes run by Avos Watersports Den and are open from 10:00am until 6:00pm daily and offers an arrive and pay launching service. The Jet Ski Lake is one of the largest in the North West and sports a docking ramp so you can easily load and unload your Jet Ski into the lake using your own vehicle. 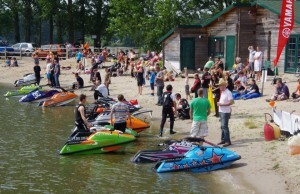 The Leisure Lakes Jet Ski Centre also sells new and used jet skis and all the kit that goes with them. Unlike some Jet Ski lakes, the facilities at Leisure Lakes are open all year round and so you can come along at any time. For more details on the products that we stock, please visit the Avos Watersports Den on the link below. Jet Ski services and repairs are also carried out. The Jet Ski Lake and repair centre are open throughout the year, so there’s always some where to take your Jet Ski, whatever the weather. Leisure Lakes is within easy reach of all the major cities in the North West of England including Liverpool, Manchester and Blackpool. The full address to the Leisure Lakes is Leisure Lakes, The Gravel, Mere Brow, Tarleton, PR4 6JX. On the Contact Us page is a map of the surrounding areas of the Leisure Lakes. Once on the Leisure Lakes complex, continue on the main track until you reach two lakes, one on the left, the other on the right. Pull into the left side and you will see Avos Watersports Den. Please enter here before putting skis into the water. Contact details for Avos Waterports Den can be found on their website.